My darling Charlie turned five this week. 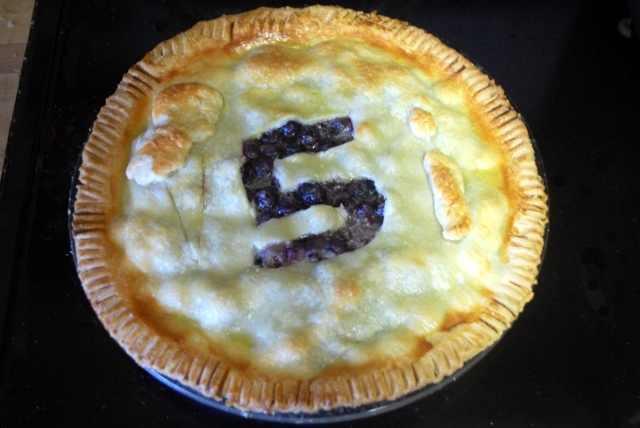 We made a blueberry pie for his birthday. 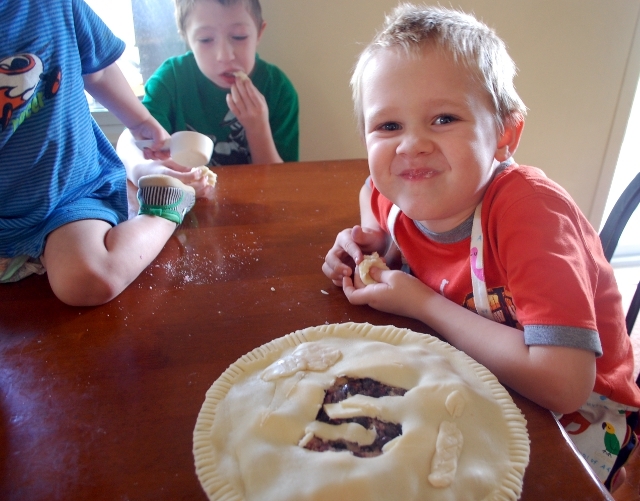 He’s going to have his fancy frosted birthday cake at his party, so he picked blueberry pie. As you can see, we still fixed it up to be awesome. Tip: candles don’t stand up very well in a still-sort-of-warm blueberry pie, even when you poke them through the crust. Sing fast. We had a lot of fun, but one of my favorite surprises of the day was something we haven’t done before. 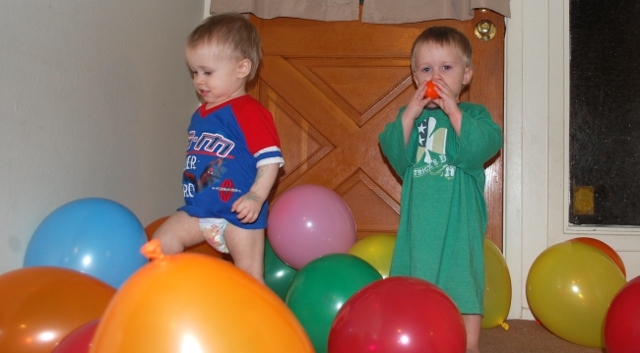 The night before his birthday I blew up a ton of balloons. Then we tied a bunch of them across his bed and piled the rest of them on the end. He was so surprised when he woke up, but he was grinning right away. And isn’t that what birthdays are about? This entry was posted in Cooking, Life in General. Hi! I'm Melissa, a twenty-something SAHM who likes to create things. I crochet, I knit, I write, and I dabble in photography and web design. I love the photo of Charlie still sleeping with all those ballons over his head – must have been a real surprise… I wonder if I would scare my own little soon to be 3 year old silly if I tried something similar for him? 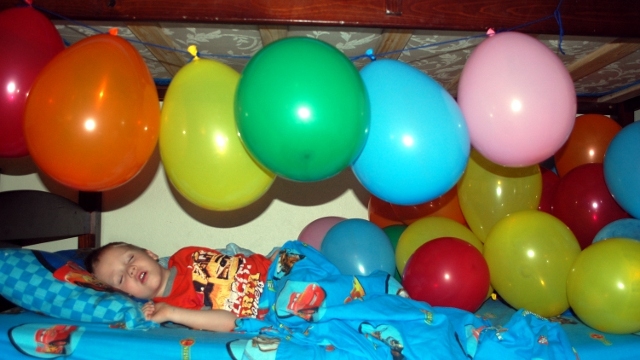 I was worried that the balloons moving around would scare him awake at three AM, and my husband was worried that we would somehow smother him with the balloons, but neither of those things happened and it seems to have had the desired affect. I think that is such an awesome idea and I can only imagine how much fun it would be to wake up with a bunch of balloons all over me! You guys are great parents and I’m sure he will remember that forever! Your little boys are so adorable and I can’t believe how much the little ones have grown from some of the first pictures on your site. I feel old now. Hi! I'm Melissa, a twenty-something at-home mom with four boys ten and under - and a baby girl, too! I'm LDS, I homeschool, and I knit, crochet, sew, cook, draw, write, and generally hold down the fort while my husband and I figure out this rural lifestyle. We're either genuinely insane or the sanest people you'll ever meet. Stick around and find out which it is!